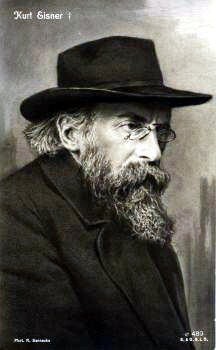 Kurt Eisner (14 May 1867 in Berlin – 21 February 1919 in Munich) was a Bavarian politician and journalist. As a German socialist journalist and statesman, he organized the Socialist Revolution that took over the Wittelsbach monarchy in Bavaria in November 1918. He is used as an example of charismatic authority by Max Weber. Eisner was of Jewish descent. ↑ 1.0 1.1 "Kurt Eisner - Encyclopaedia Britannica" (biography), Encyclopædia Britannica, 2006, Britannica.com webpage: Britannica-KurtEisner. Wikimedia Commons has media related to Kurt Eisner. This page was last changed on 18 July 2017, at 10:47.